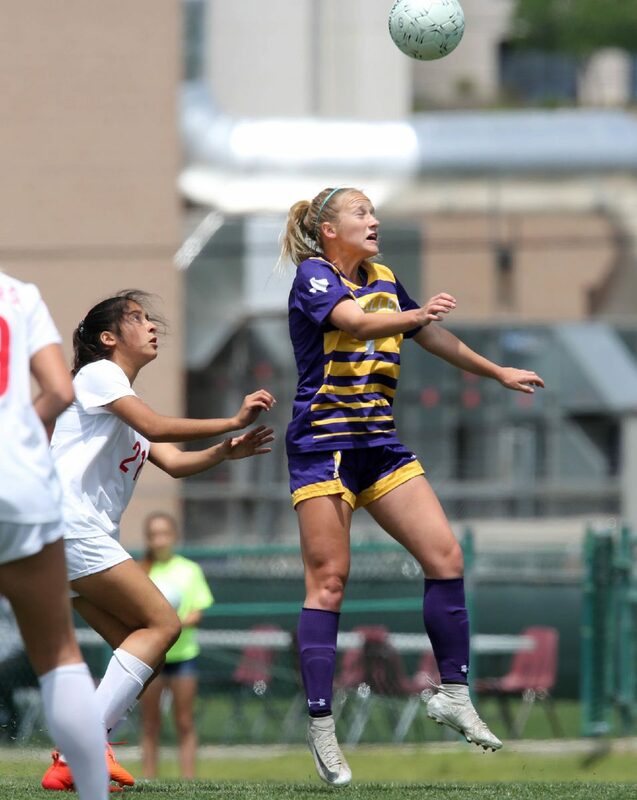 McALLEN — When the going got tough for the McAllen High girls soccer team on its run to the UIL state tournament, Westyn Henderson got going and lifted her team, carrying girls soccer in the Valley to new heights. A promising group of young Bulldogs grew into a hungry beast that wouldn’t be stopped by any Valley competition. From the midfield, Henderson led via possession and dribbling as McHi reached the regional tournament against stiff, organized defenses. She stayed responsible defensively and her fingerprints were all over wins versus San Antonio and Austin competition. In the regional semifinal, McHi’s coaching staff asked her to utilize her skills on top as an attacking forward, and she excelled. McAllen High's Westyn Henderson heads the ball as Austin Lake Travis' Alana Clark defends during the first half of their Class 6A regional final match Saturday, April 14, 2018, at Blossom Athletic Center in San Antonio. McAllen High won the match 1-0. 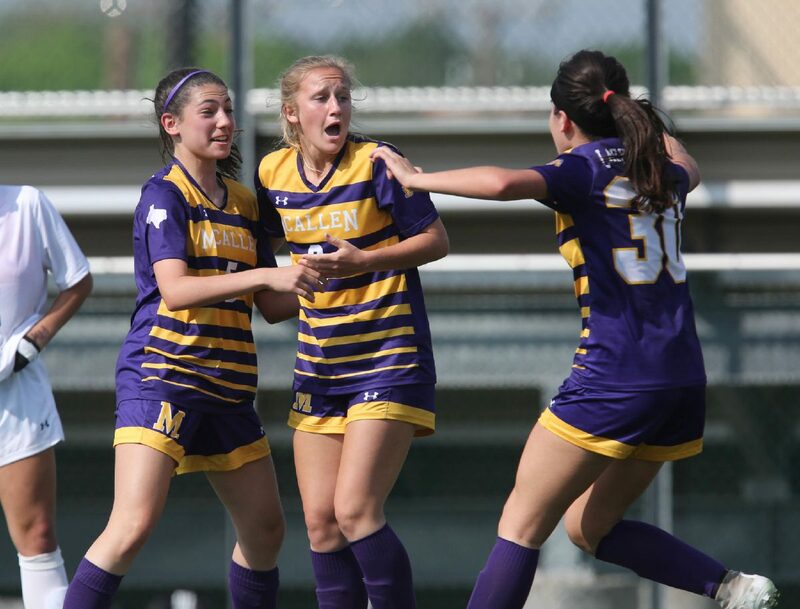 McAllen High's Westyn Henderson, center, celebrates a goal with Chloe Fallek, left, and Ava Alaniz during the second half of their Class 6A regional semi-final match Friday, April 13, 2018, at Blossom Athletic Center in San Antonio. McAllen High won the match 2-1. The speedy sophomore said that a year of refinement landed the Bulldogs in the state semifinal match, marking the first time a girls team from the RGV reached that stage. Her 18 goals and 26 assists during the 2018 campaign, including her stunning goal in the regional semifinal and assist on Ava Alaniz’s game-winner in the regional championship, secured her spot as The Monitor’s All-Area Player of the Year. She was also named to the UIL State All-Tournament Team. 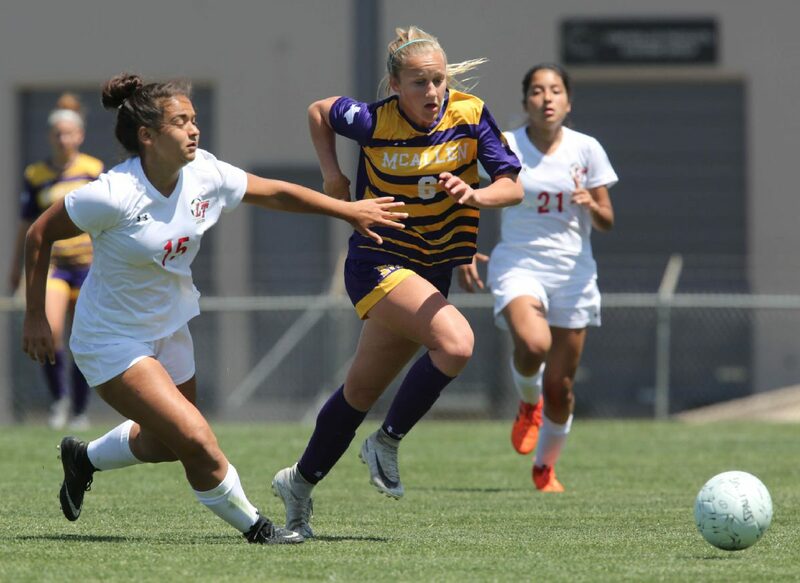 In any given game, Henderson might take the ball from a deep defensive midfield position and dribble until she finds a better option. She’s a threat to unleash a deep shot, but not before she’s looked over all the passing options. She attributes the freedom of motion to the solid safety net behind her. Against San Antonio Johnson, Henderson made her case for play of the year with a determined run through the Jaguars defense. With the score tied, Henderson took the ball at midfield and ran hard left. Once inside the penalty box with a defender closely marking her, she cut left to freeze the defender, then spun left for more space before unleashing a short-side snipe to lift McHi to the regional final. In the championship against LakeTravis, she was marked even closer and limited in her chances. But with the game still scoreless, she saw fellow midfielder Alaniz one-on-one with a defender and delivered a pass that sent her in alone on a breakaway for the victory. Her coach, Minnesota native Patrick Arney, compares Henderson’s play to Wayne Gretzky or Michael Jordan due to her ability to not just be outstanding, but also make her teammates great. Her play on elite club teams, plus her leadership on the area’s best high school girls team in history, helped Henderson earn an offer from Texas A&M, where she is now verbally committed. Henderson knows that 2018 is a year that will live on for not only McHi, but the city and entire Valley soccer community. She said that realization pushes her to make the next two years of high school even better than the first two.